This basic sweet yeast dough recipe is known as zdobne drizhdzhove tisto in Ukrainian and sdobnoye drozhzhevoye testo in Russian. It is used to make breakfast buns (sweet rolls), coffee cakes, filled tea rolls, nut rolls, poppy seed rolls, Russian-style "pie" known as pirog and Ukrainian Christmas cake, known as perekladenets or perekladanets, among other pastries. To proof the yeast: In a small bowl or glass measuring cup, stir together 1 package active dry yeast and 2 tablespoons sugar in 1/2 cup warm water. Let proof until bubbly. To make the dough: Scald 1 1/2 cups milk, remove from heat and add the butter, allowing it to melt. Stir in the 1/2 cup sugar and let the mixture cool to lukewarm (no hotter than 110 degrees). In a large mixing bowl using a Danish dough whisk or wooden spoon, or a stand mixer with the paddle attachment, beat 3 large whole eggs and 3 large egg yolks until thick. Add 1 teaspoon vanilla, lemon zest, and milk-butter-sugar mixture and combine well. Add the yeast mixture and beat well. Add 1/2 teaspoon salt and 2 cups of the all-purpose flour. Beat until well incorporated. Stir in the additional 4 cups all-purpose flour and knead for 10 minutes or until dough is smooth and elastic. It will be sticky. If using a stand mixer, switch to the dough hook for kneading. Scrape down sides of the bowl and cover with greased plastic wrap or a linen towel (not terry cloth) and let rise in a warm place until doubled. The dough is now ready to be used as desired. This recipe will make 2 nut rolls or poppy seed rolls, 2 Russian-style pies (Pirog), or 30 tartlets. 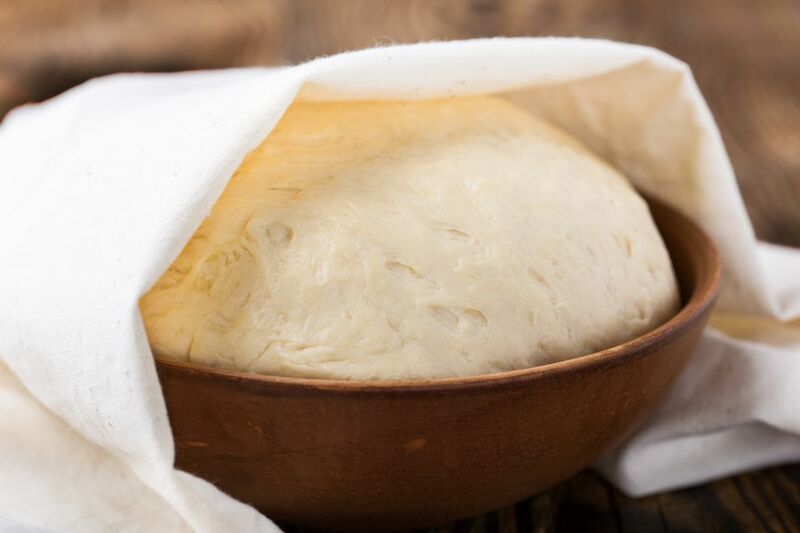 You can refrigerate this dough for up to 24 hours to be made up later.